What DCC systems will DecoderPro work with? What hardware do I need? How do I start the program? 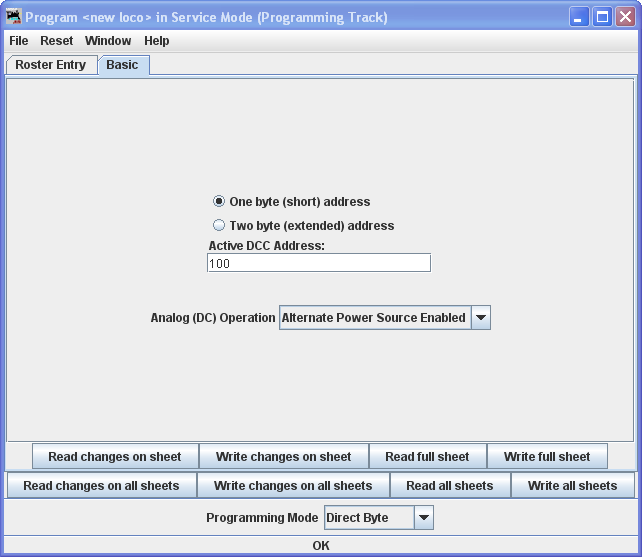 How do I start DecoderPro® program for the First Time User? How do I set up my Preferences? How do I set up to program a decoder? Entering Locomotives in the "Roster"
What if I need to do more? You may have noticed that at the top of the window are Two tabs: Roster Entry and Basic. We have completed the Roster Entry pane of the Program window, now, click on the Basic tab to change panes to continue with programming your decoder. The Basic pane will be displayed and look similar to the following illustration: Many panes in the programmer contain decoder dependent features, as a result what you see may not exactly agree with what you see here. Only those variables that your decoder can implement will be shown. The decoder address (should be unique among your locomotives, unless you are operating several as a set) often the locomotive number is used. control) Enable Analog Operation with caution, as some decoders will jump to full speed resulting in a "Runaway locomotive" if they are enabled for Analog Operation and encounter power spikes on a DCC digital signal. They seem to get confused, and revert to Analog operation and use the full track voltage DCC power to take off and GO! There is no stopping them without removing layout power. Very disturbing to your operating mates, but better than running into them at full tilt. To enable Analog (old style DC, some vendors refer to this as dual mode) Operation select the appropriate entry from the drop-down list. To read the actual settings for these options (and IF your system and installed decoder will allow readback of decoder values), click on the . The individual settings will turn red while they are in the process of being read (clever, eh? ), and will turn white once the values have been read successfully from the decoder. Once again, Decoder Pro must play "Twenty Questions" to get this information, and sometimes even has to ask a couple of times. Be patient, especially with older computers. At the very bottom of the pane (where it says "idle") you will see a running account of exactly what DecoderPro is doing, for example, the specific CV being read. Again, the and functions are dependent on your command station. If your system does not have the capability to read CVs, then these buttons will not be available. If you wish to change the address of the locomotive, type in the new address. To turn on or off 4 digit addressing, select the desired radio button. . Be sure that the address type agrees with the number of characters in the address. When you are finished, click on to write the new values in the decoder. Writing usually takes much less time than reading, because the value can be sent directly. As the write operation proceeds, the data will change from yellow to white. If there is difficulty writing to the decoder, the data will change to red. The software will automatically keep trying until the write operation is successful. In some instances the system will "time-out" after a certain number of tries without an acknowledgement from the decoder. This does not necessarily mean that the values have not been written, just that the program has not received an acknowledgement. This can be due to the locomotive moving and getting on dirty track so that it can't pulse back, or possibly because the command station or decoder cannot read back. Try moving the loco and try again. If it is a command station or decoder read-back issue, try the loco on the mainline and see if the programming was successful. To finish this "basic" programming of a decoder, click once more on the Roster Entry tab, You will see that the address field has now been filled in, so you can now click on the . Your new decoder settings have now been written not only to the decoder, but also saved to a computer file where they may be recalled in the future. I have programmed the address for this locomotive and clicked on the Write full sheet button to send the address to the command station to program the decoder. Note that the status line keeps you updated as to what is writing and should finish with OK, which is good or an error message which usually meant the write was not completed. All the entries are now in white color as they match the decoder. Now that we have entered the Roster data and set the desired address, lets return to DecoderPro Main window by closing the Programming window. Notice that we now have a list of all the locomotives programmed so far that are in our roster. 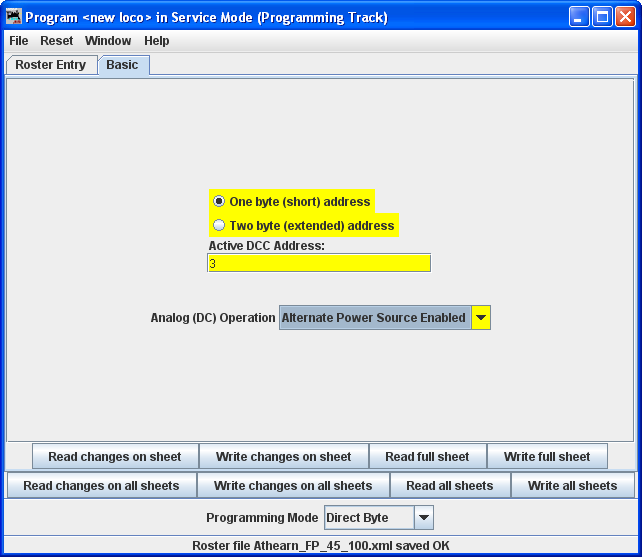 What we've done so far is what is available in the Basic mode of programming in DecoderPro. Which is basically put Locomotive in the roster and assign an address. A good place to start for new folks or at a club. It's hard to go wrong, but you can change the loco address and add it the roster, which are the two most often needed actions with programming. The classic DecoderPro offered a number of modes, most of which were often redundant and confusing showing how the user could edit the underlying file to make special application programming modes. The Comprehensive Programmer was the most popular for a long time until Advanced came along with added features. So now they've been combined in DecoderPro. Thus the Comprehensive Programmer with added Advanced features is the only other programmer that DecoderPro offers. Since we've already covered Basic, let's explore the DecoderPro Comprehensive Programmer! Select the Locomotive that you want to program in Comprehensive Programmer, then double click on selection to open Programmer. At the bottom of the window is the Labels & Media andThrottle buttons. Use these buttons to set up the Icon photos for your roster entries and to set up the Function Labels on the software throttle included in JMRI. Click the links that we've included and take a look.